Presented thin lens-like crystals, often reminding octahedrons in a due form. 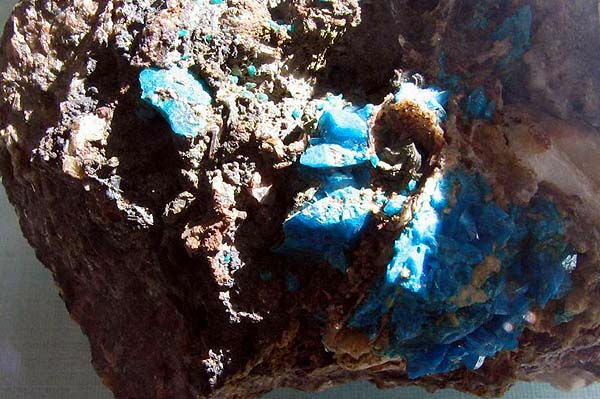 Colouring is sky-blue, brilliance of glassy, mineral is transparent. Lirokonite, lentil ore (mineral from the group of water arsenic-sour compounds). We will dissolve in acids. In the process of heating, before to be melted, changes a color, becoming chlorine. 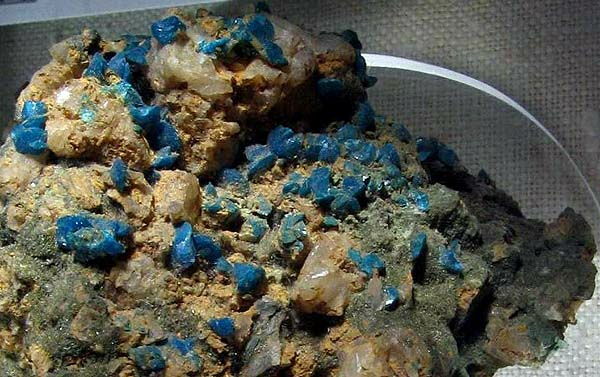 Be found in the area of oxidization of copper-ore deposits together with a cuprite, malachite, olivenite, arsenic-copper ore, chalcophilliite and swamp ore. Arsenate. Met in Redrut and Sent-dey on a peninsula Kornuoll, in Kherrengrund in Czech Republic (EU), in Saxony and Tyuringiya (EU). Liroconite. Kornuoll, England, Great Britain. A photo: © A.A. Evseev. Cumeb, Namibia. A photo: © A.A. Evseev.